Finding rental housing can be tricky enough, but it can reach nightmare levels if you have a furry friend that’s been labeled a member of a “restricted breed,” a list that seems to grow longer and spread further every year. What exactly constitutes an “aggressive breed” anyway? The expression implies a pre-disposition to violence, so you’d think it would be the dogs who are most likely to bite someone, right? Not so much. The Journal of Applied Animal Behavior Science did a study of 33 breeds of dogs to determine the most likely to become aggressive. The article says, the most aggressive breed out of all 33 breeds studies was… (drum roll)… The Dachshund. That’s right, the wiener dog. The study found that “one in five dachshunds have bitten or tried to bite strangers, and a similar number have attacked other dogs; one in 12 have snapped at their owners.” Number two on the list was the Chihuahua, and Jack Russells came in third. So where’s the Pitbull, Rottweiler, German Shepherd, and Doberman? Alas, the usual suspects are nowhere to be found. 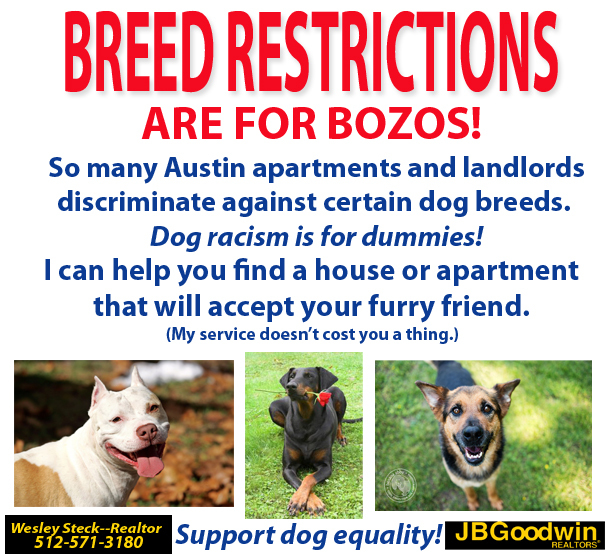 Nevertheless, they are the ones most commonly discriminated against on breed lists enforced by countless apartment complexes, leasing agencies, and insurance companies. Meanwhile, the dachshund of chihuahua fly completely under the radar…. The problem has a troubling effect. Austin Pets Alive reported that the number one reason people surrendered their pets in 2015 was due to housing breed-restrictions that left the families no choice other than to give up their beloved pup, resulting in over-crowded animal shelters. This is clearly a problem with no easy solution in sight, but in the meantime what can you do to find a place to live with your pet? Since I’ve started doing real estate in 2014, I’ve found a few methods that better your chance of finding truly “pet-friendly” housing. If you’re looking for an apartment, there’s lists available of complexes that don’t have breed restrictions. Roscoe is one such growing apartment company. You can expect to pay a hefty pet deposit and fee, however – often around $400 refundable and another $400 non-refundable pet fee. The group “Love-A-Bull” provides an awesome community resource and support network in the Austin area as well. 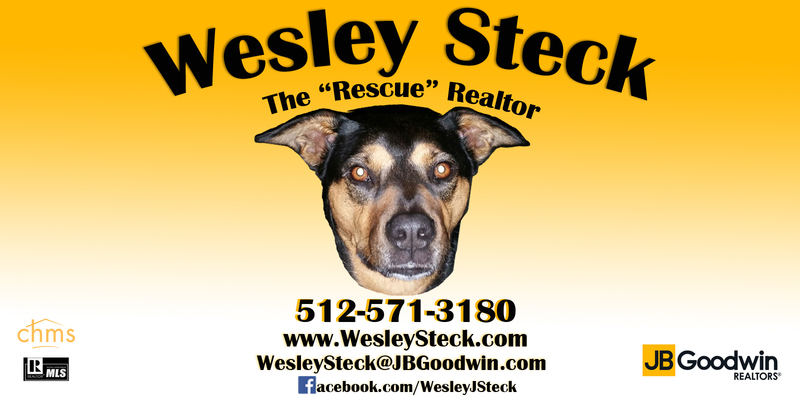 I’m proud to be one of their preferred realtors and have helped a good number of their members overcome pet-restrictions and find housing. For a list of resources they provide, check their site here. How many beds/baths would you like? How many pets? Age and weight? Type of home? House, duplex, fourplex, condo, apartment, or all the above? Click here to read a summary of the process, but once your realtor plugs in these search items they will send you an email to access the MLS. This “MLS portal” will show you all the housing options currently listed that fall within your search. Offer to get renters insurance that covers pet liabilities. It may not be necessary in the end, but it’s helpful to offer. This reassures them that if the nightmare scenario plays out of your dog escaping and rampaging the town, they won’t be on the legal hook (as much anyway). Get a friend or neighbor to write a quick letter/email testifying to the dogs good nature. Letters of reference aren’t just for jobs and getting into college and they do help. In addition to showing that your dog is up-to-date on vaccinations and shots, it shows you are a pro-active and good dog parent. Landlords who are “on the fence” almost always ask for a picture, so beat them to it and send one from the beginning. Something with your dog wearing a sweater or snuggling with kids is a bonus. Introduce yourself and your family and give the landlord a better idea about your awesome family! This helps you jump off the page of an otherwise lifeless application. Include any details about training or events you’re dog has had or been a part of. Outside of Austin and need help? Fill in the blanks and rinse/repeat. It’s a numbers game and you’ll get a lot more “no’s” than you’ll like, but persistence will pay off! I hope one day some type of dog personality test can be developed to allow dogs to prove that they’re not a threat and allow them to get the same opportunity as other dogs. In the meantime, the battle against breed discrimination is real. Thanks for reading. Feel free to reach out and good luck!